Studies show that traffic enforcement also helps to reduce crime. During a traffic stop, law enforcement officers may come across individuals who have a warrant for their arrest, discover drugs and stolen items, and much more. With many law enforcement agencies experiencing a reduction in the number of officers, numerous agencies are now using a multifaceted approach to making their community a safer place to live, work, and enjoy. 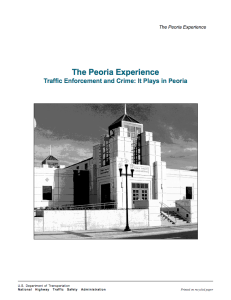 Over a three year period (1994 through 1996), Peoria experienced significant reductions in violent crimes, property crimes, and traffic crashes. New leadership brought traffic enforcement back to the forefront as a valued way of doing business . . . and got results.